Why settle for less - when you can have it all with Doran new 2200CW Checkweigher! With a built-in 250 product database, versatile communications, powerful control options, and outstanding PC support software, the 2200CW has it all in a simple to use, technologically advanced and extremely rugged package. Store, recall, and weigh with the 2200CW built-in database! This internal database will store up to 250 Checkweigh Tolerances, Tare Weights, Accumulation and Counter totals and a description field by a six digit Product ID. Recalling a product from the database is as simple as pressing the PROD button and entering the product ID. Adding new products or maintaining existing products are quickly accomplished through the keypad or by using Doran’s innovative CheckWay Windows? compatible software. The data is password protected to ensure that your products are checkweighed properly every time. 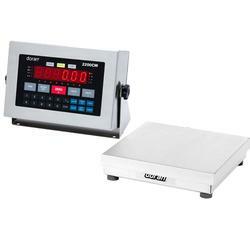 Handwritten production records to track weighments or accumulated weight are a thing of the past with the 2200CW. The counter memory stores the number of weighments. Recalling the accumulated weight at the end of a pallet load of product or the end of the shift is as simple as pushing a button. Connect with any device or computer using the two standard RS-232 ports, or with the optional Wired Ethernet, Wireless Ethernet, Modbus/TCP, USB, 4-20mA, RS-485 or Fiber Optic. Communicate with flexible and user definable data strings to include standard scale information, product ID, and product description. This allows for an easy interface with barcode printers, data collection systems or other remote devices. Control your process with eight standard setpoint outputs and two setpoint inputs. The optional relays can be mounted inside the enclosure to provide a turnkey, washdown and compact solution. Use board level outputs and relays to control lights, valves, or any other process control based upon scale weight or checkweigh status. Shielding the display elements and the scale electronics from water and puncture damage, the Guardian touch panel is four times thicker than the competition. The responsive keypad is bonded to a metal plate and is secured to the inside of the case with adhesive and bolts. 1000% overload protection! Load cell damage caused by shock and overload has been eliminated with the unique ?Quad Spring? base design. Shock overload is transfered to the frame of the scale base, protecting the sensitive load cell. Doran’s gasket design seals out any moisture, even from a direct hit with a high pressure hose. Combining a rigid metal reinforcement with highly flexible Silicone material results in a gasket that has remarkeable sealing characteristics without deforming. Heavy duty 304 Stainless Steel construction and NEMA 4X classification for washdown protection. The case features a unique cover to backplate mating system that prevents overtightening of the bolts or deforming of the backplate - two major causes of leakage and moisture damage.